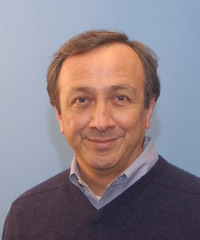 The IEEE Computer Society has awarded a 2011 Technical Achievement Award to J. J. Garcia-Luna-Aceves, Baskin Professor of Computer Engineering in the Baskin School of Engineering at UC Santa Cruz. The award honors Garcia-Luna-Aceves "for pioneering contributions to the theory and design of communication protocols for ad-hoc wireless networks." An expert in networking and communications, Garcia-Luna-Aceves serves as chair of the Department of Computer Engineering at UCSC and directs the Computer Communication Research Group and the Network Sciences Institute. He is also a principal scientist at the Palo Alto Research Center (PARC). Garcia-Luna-Aceves has played a leading role in efforts to advance the science of wireless networks. He led a multi-university project called Dynamic Ad-hoc Wireless Networks to develop and test new routing protocols to increase the capacity of wireless networks. He and UCSC engineering colleagues are also involved in the Communications Networks Academic Research Center, a multi-university collaboration funded by the U.S. Army Research Laboratory. He is a fellow of the Institute of Electrical and Electronics Engineers (IEEE), the Association for Computing Machinery (ACM), and the American Association for the Advancement of Science (AAAS). The IEEE Computer Society Technical Achievement Award is given for outstanding and innovative contributions to the fields of computer and information science and engineering or computer technology, usually within the past 10, and not more than 15, years. Contributions must have significantly promoted technical progress in the field. The award, which consists of a certificate and $2,000 honorarium, will be presented at an awards dinner on May 25 in Albuquerque, New Mexico. With nearly 85,000 members, the IEEE Computer Society is the world's leading organization of computing professionals. Founded in 1946, it is the largest of IEEE's 38 societies. The Computer Society is dedicated to advancing the theory and application of computing and information technology.